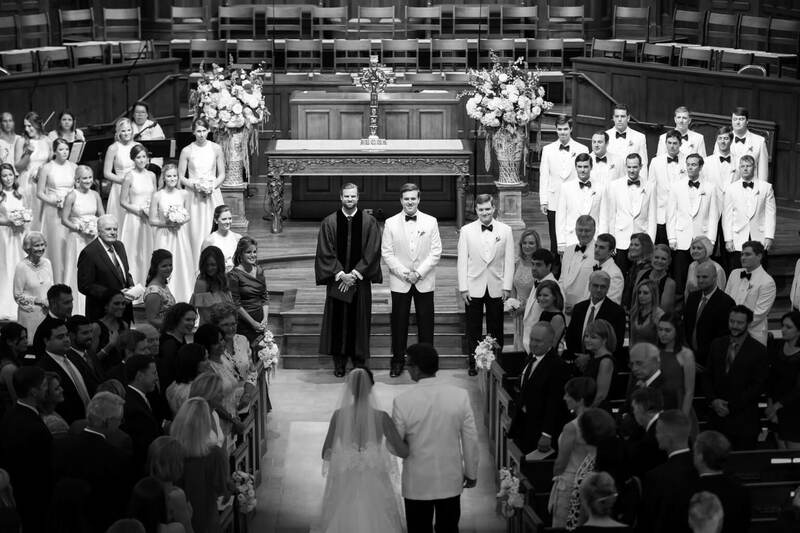 On a warm, summer day in July, the time had finally come for friends and family to witness Anna and Will’s nuptials. 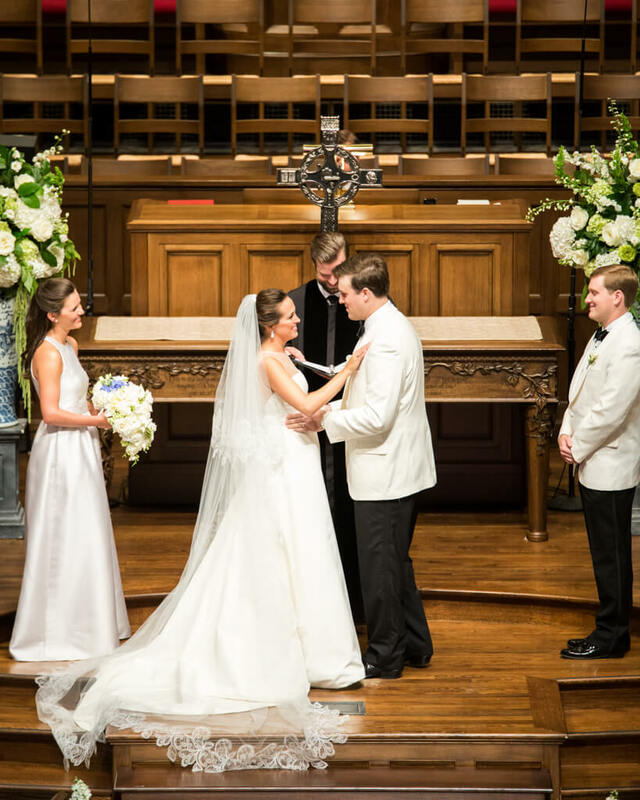 The beautiful house of worship was elegantly decorated with ivory florals at the ends of pews and tall blue-and-white vessels flanking both sides of the altar. 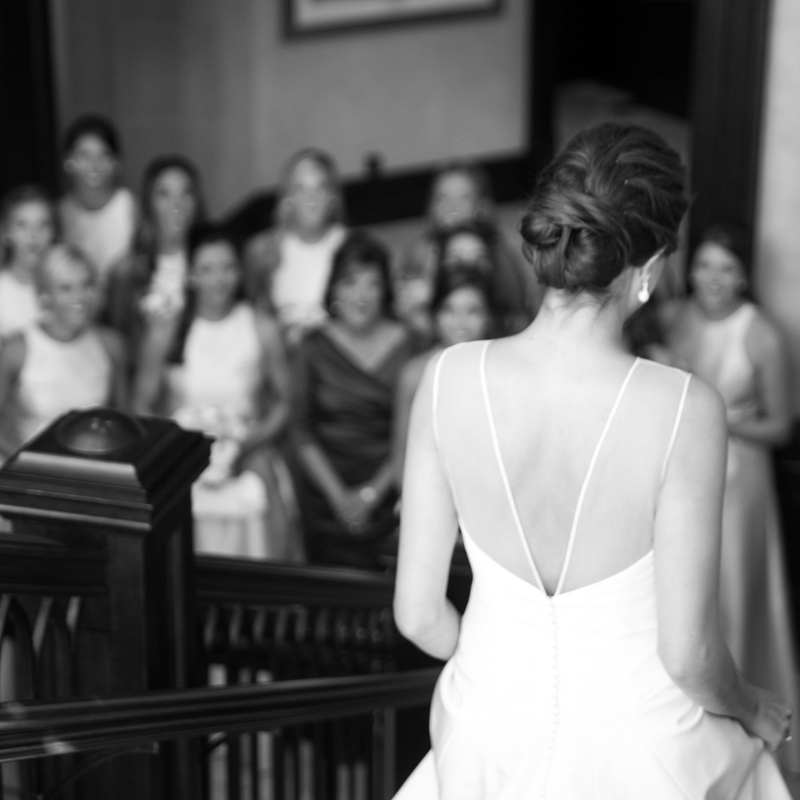 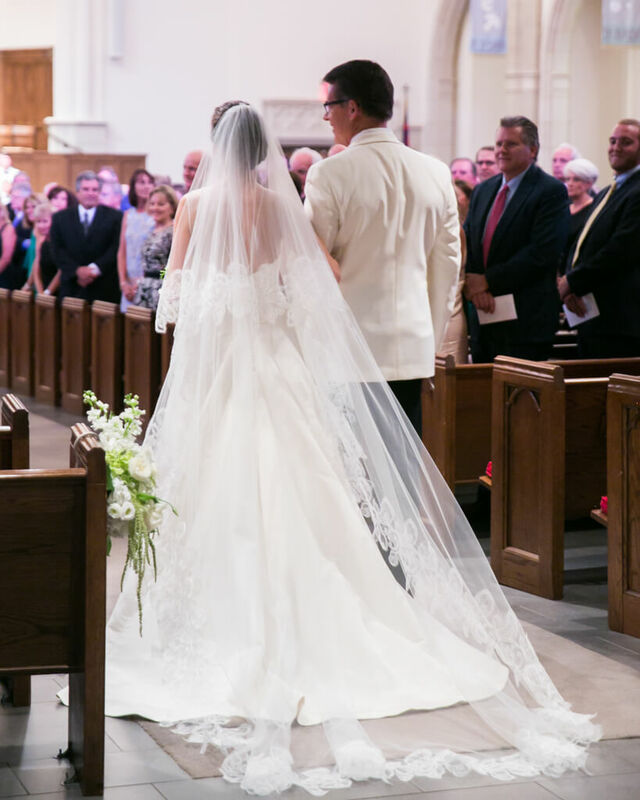 As the church doors opened, Will was left speechless as he saw his bride walk down the aisle in her sleeveless A-line gown featuring an illusion neckline. 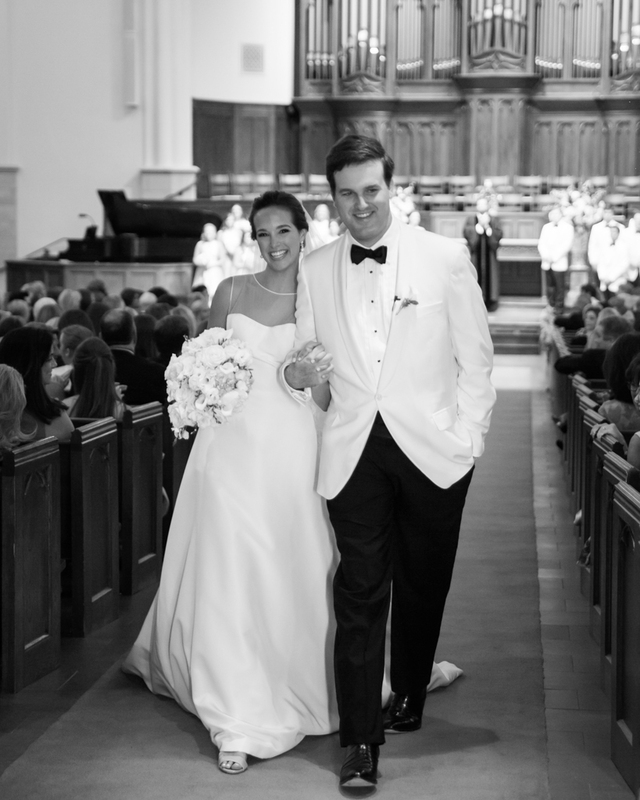 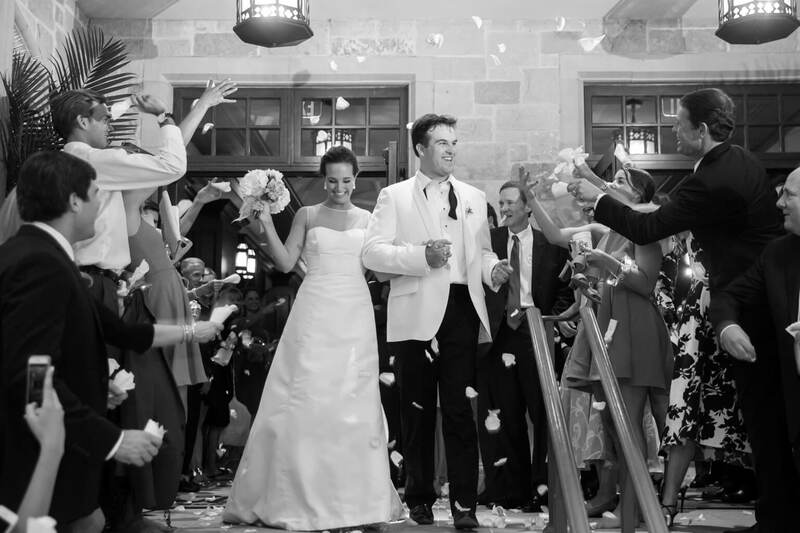 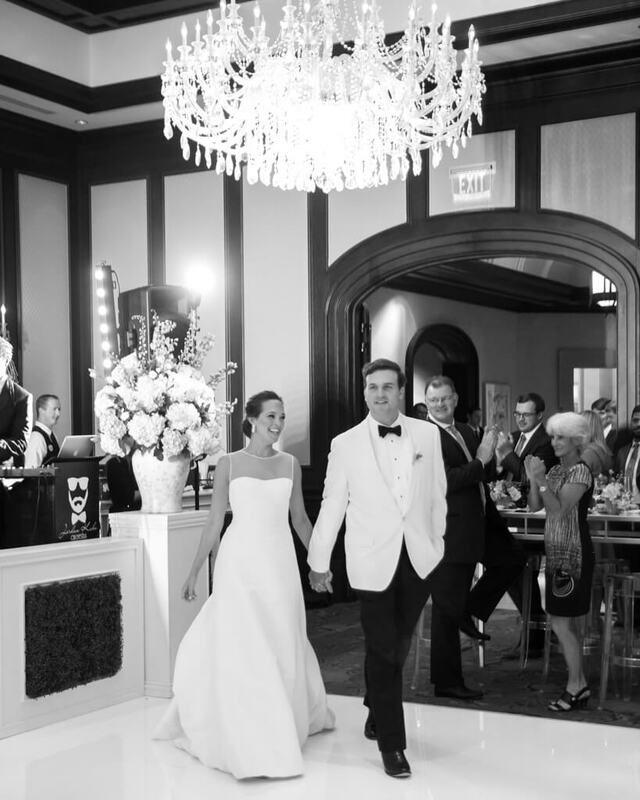 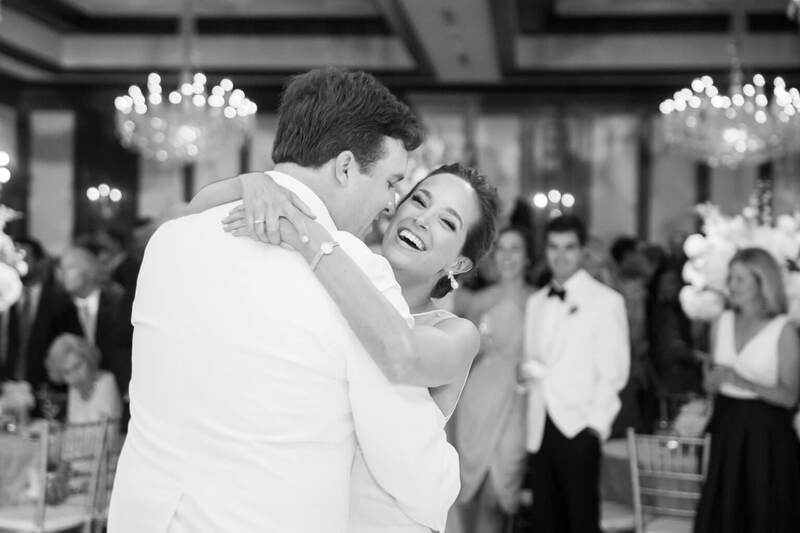 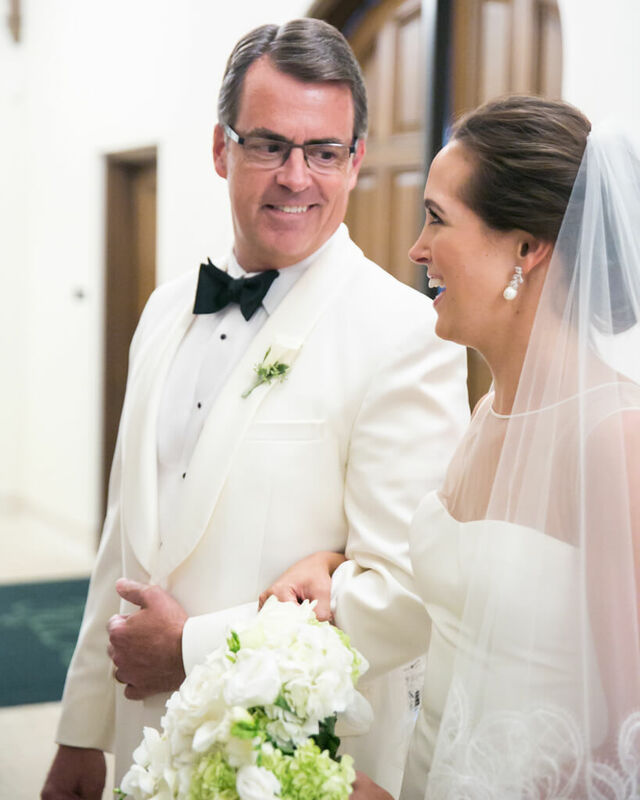 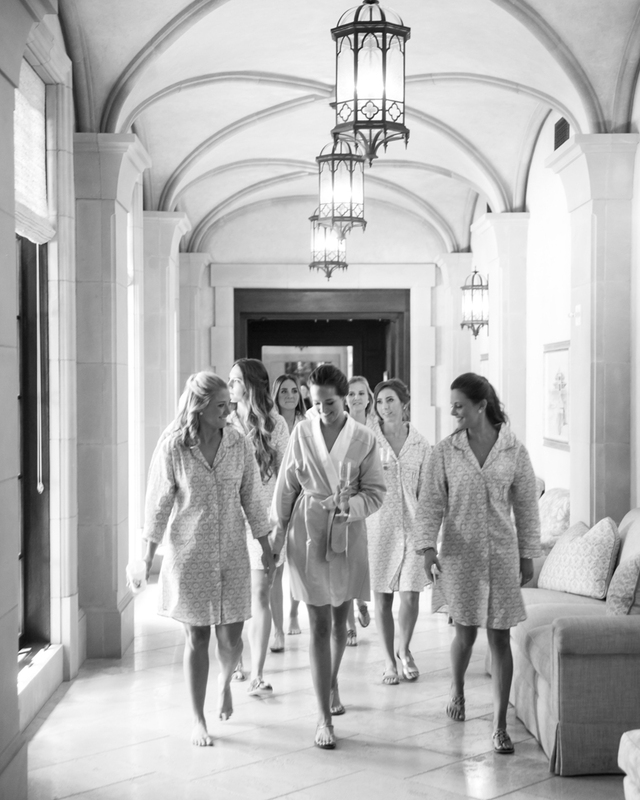 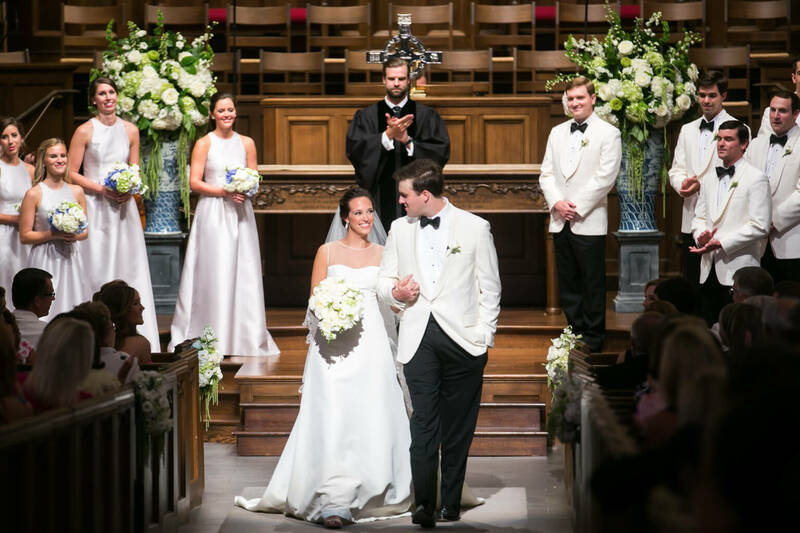 Anna carried a cascading bouquet of ivory blooms as she met her groom, who donned an alabaster tuxedo jacket and black bow tie, at the front of the church to exchange vows. 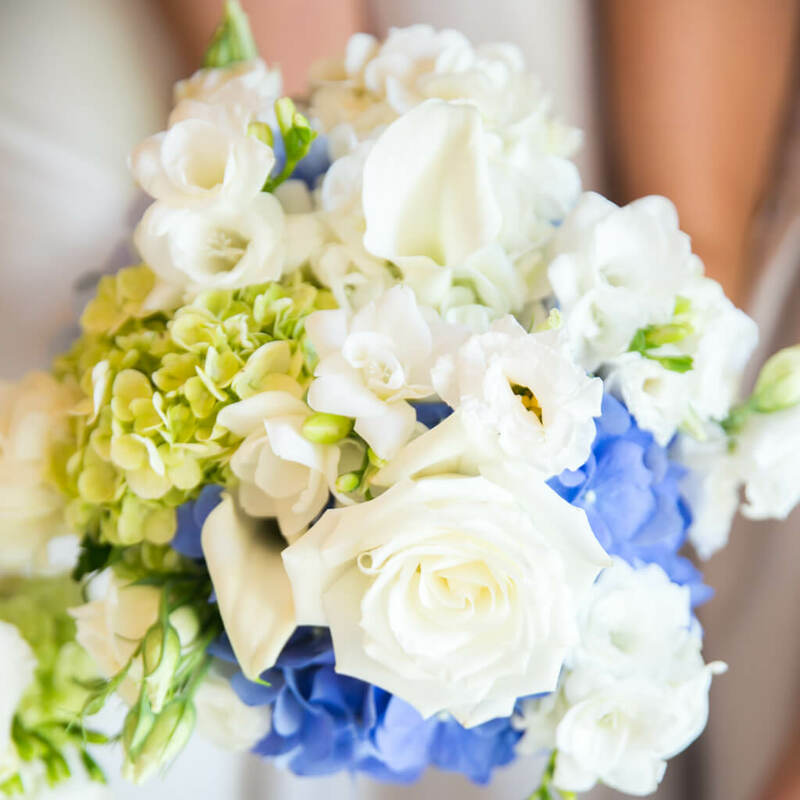 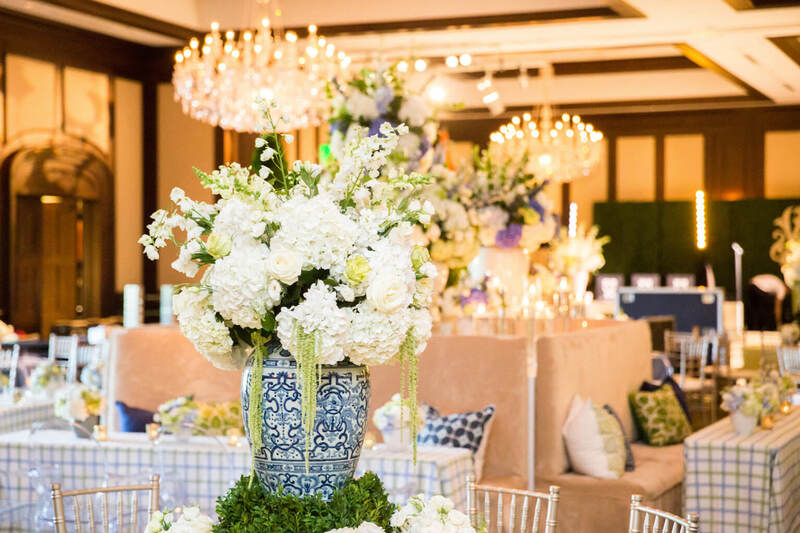 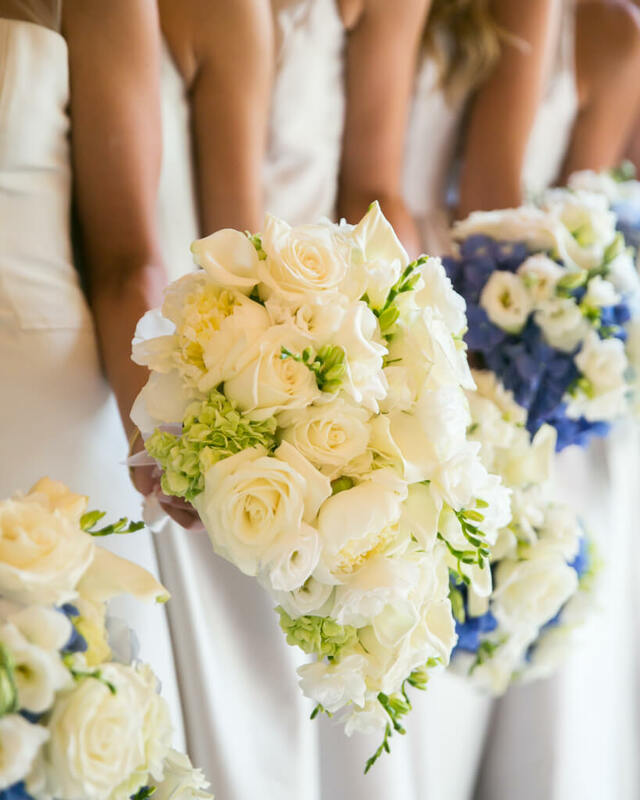 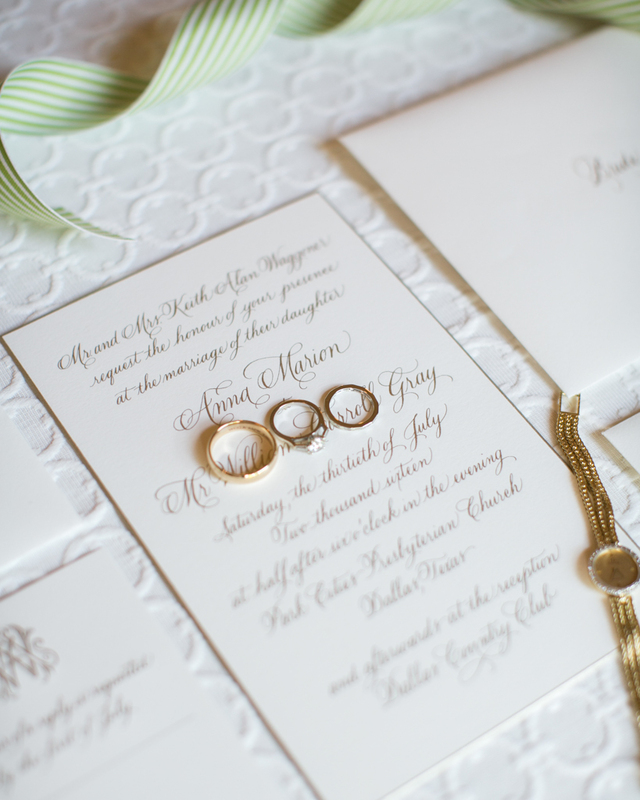 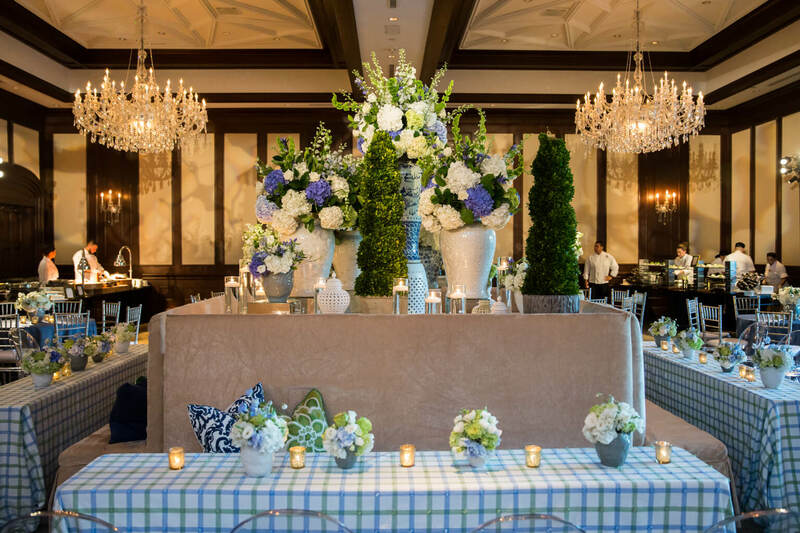 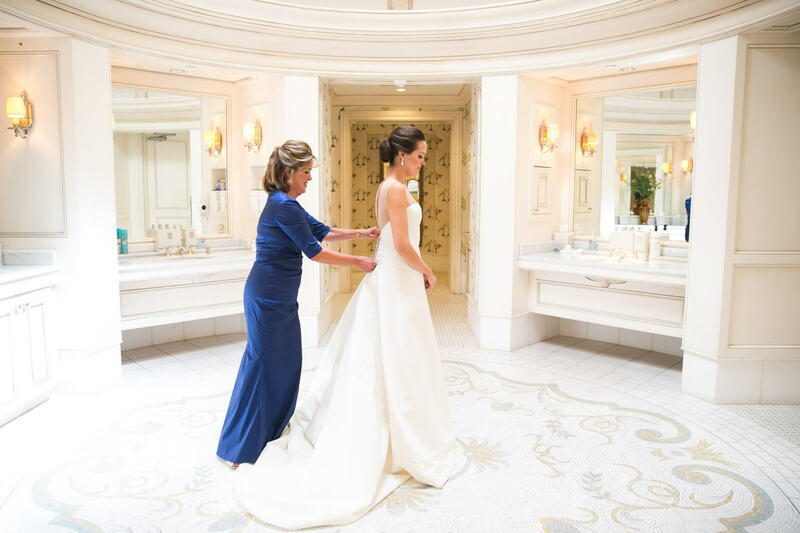 Following the service, guests were transported to a nearby country club where they found their seats in a ballroom showcasing classic décor in a summery color palette of light greens, blues, and ivories that celebrated the couple’s love of nature. 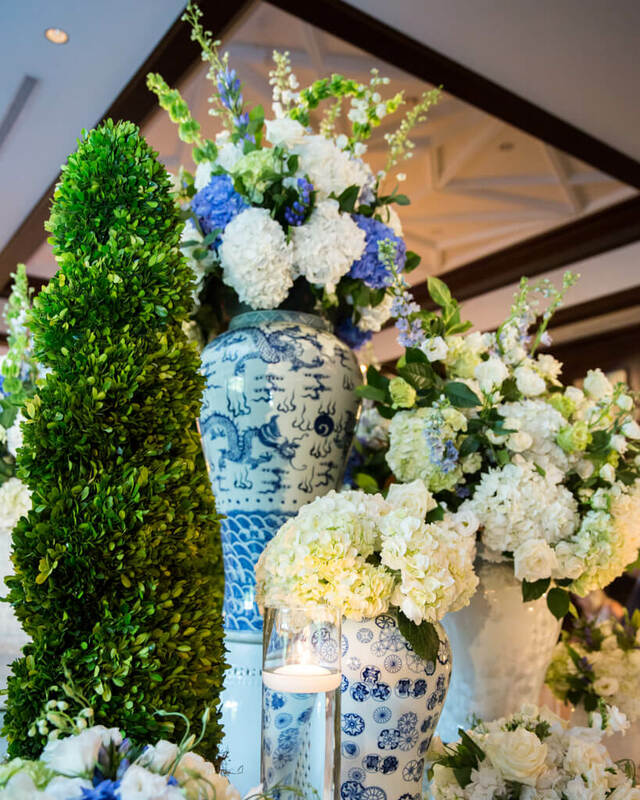 Round tables were adorned with either lime or ocean blue linens, and centerpieces alternated between tall blue-and-white ginger jars or alabaster vessels filled with hydrangeas, roses, and amaranthus. 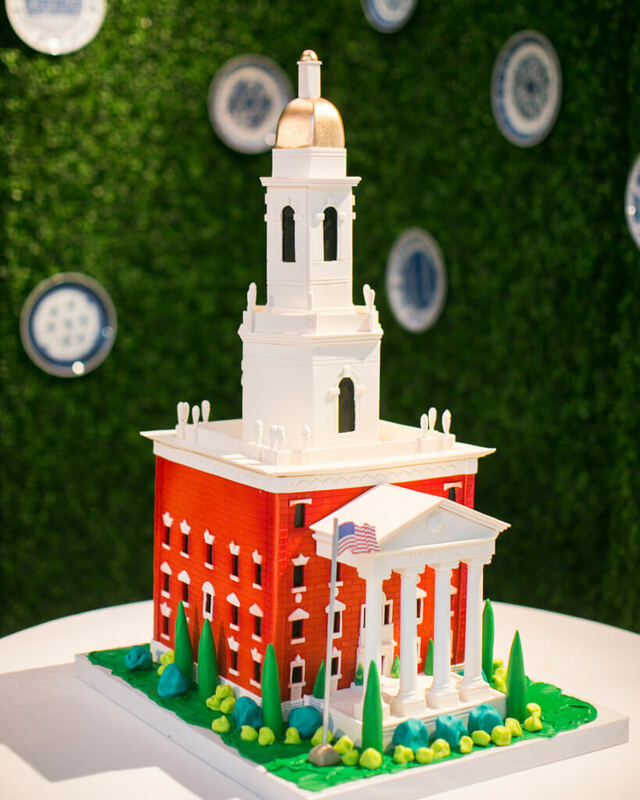 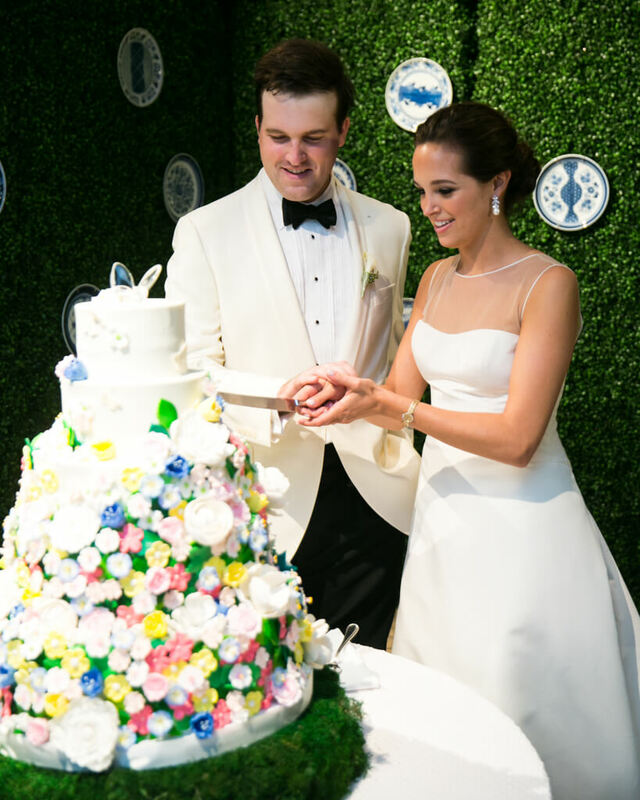 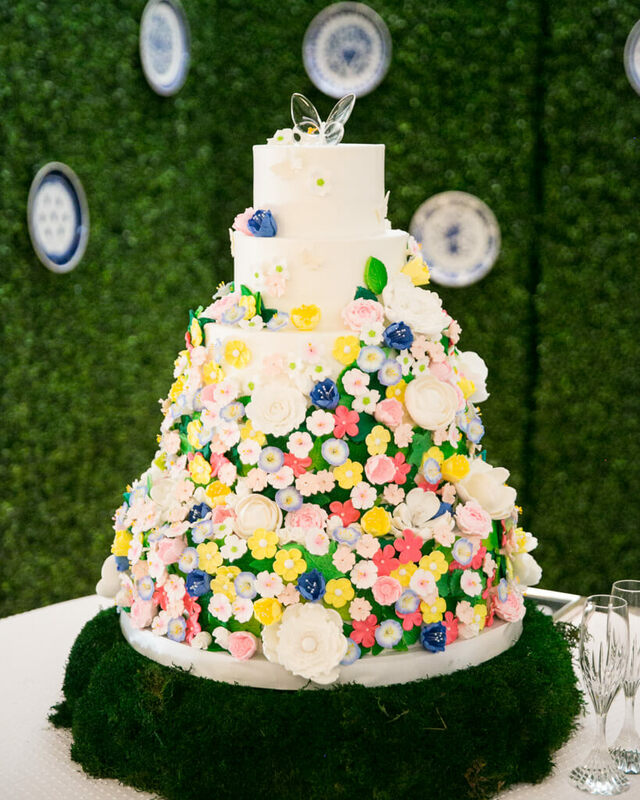 After dinner, attendees enjoyed slices of the couple’s colorful confection decorated with sugar flowers and butterfly details, which was surrounded by green hedge walls dotted with blue-and-white china plates and a custom wooden monogram. 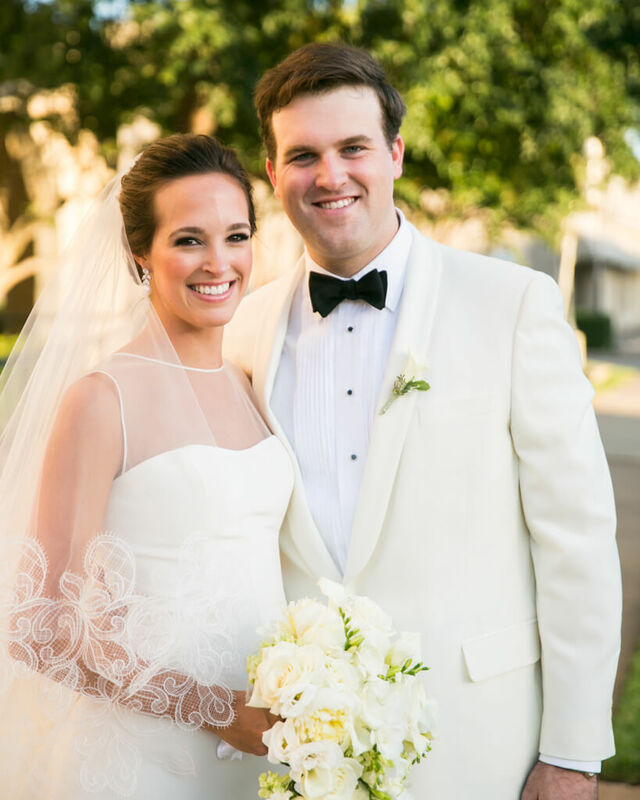 Throughout the celebration, libations were served from a bar presenting koozies personalized with Anna and Will’s wedding date, monogram, and “Oh Happy Gray!” as an ode to their new shared last name. 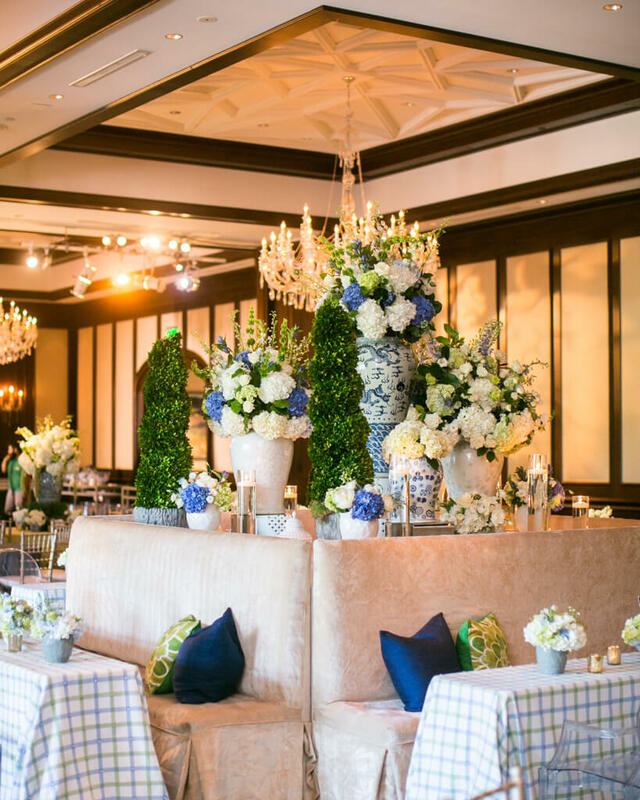 Performing on a stage featuring boxwood elements, a spectacular live band kept revelers on the dance floor all night long. 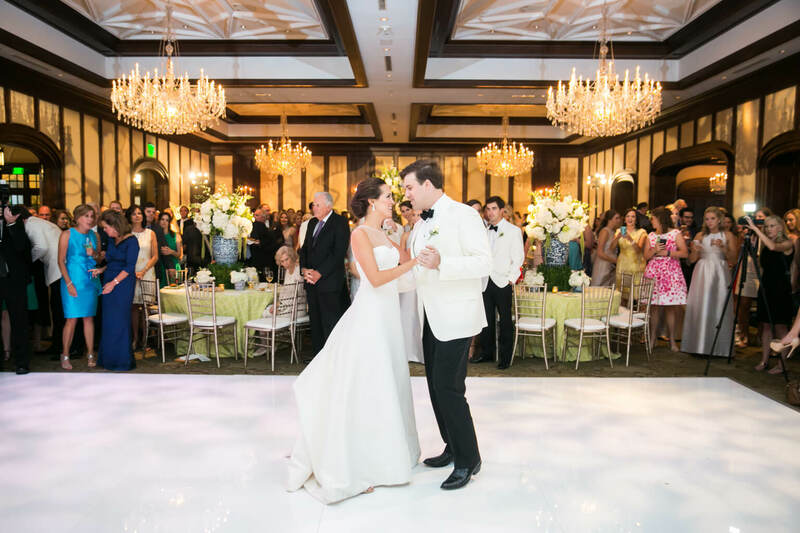 Plenty of singing and dancing ensued, and party accessories, such as sunglasses and glow sticks, kept the celebration alive. 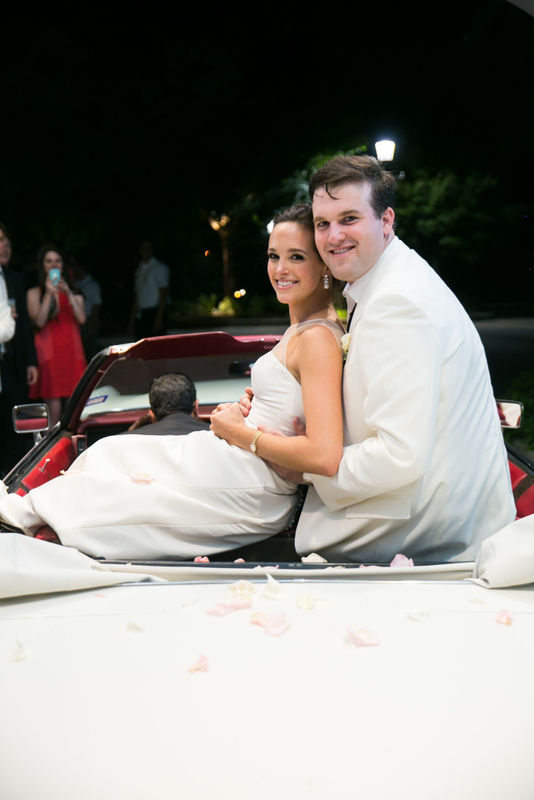 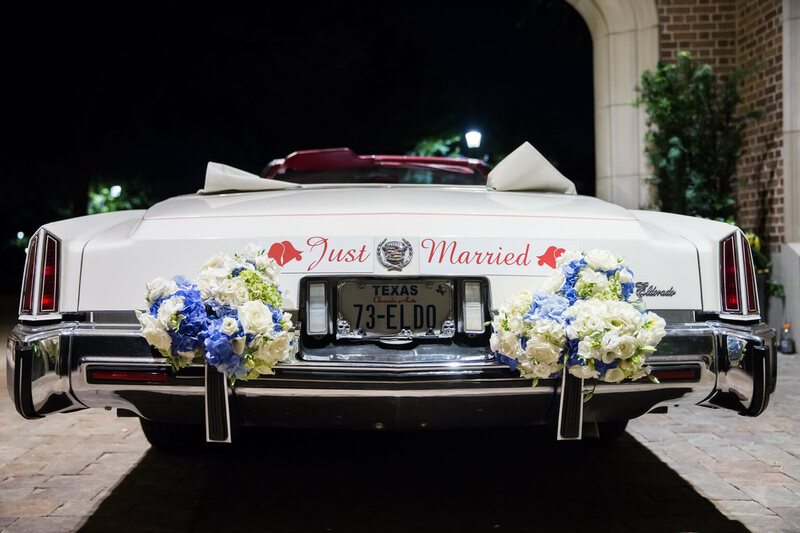 When the night came to an end, loved ones tossed flower petals as the couple exited the reception before riding off together in their getaway car as husband and wife.